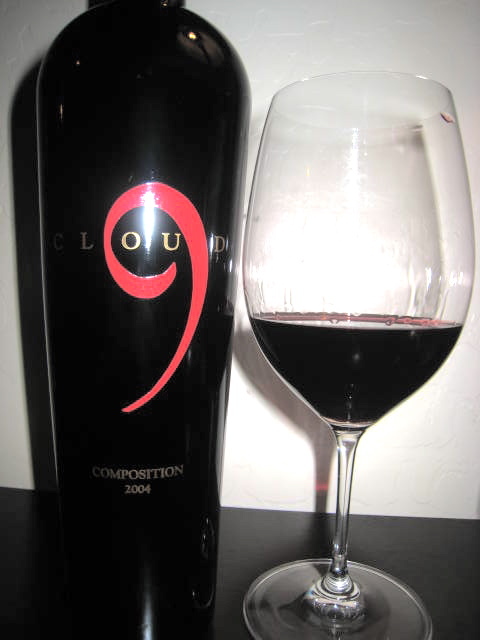 This 2004 Cloud 9 Composition is a proprietary blend of Tempranillo, Cabernet Sauvignon, Syrah, Petite Verdot, and Barbera. It's produced from grapes grown in the Sierra Foothills region of California, but has a distinctive Napa Valley winemakers style. The wine is without doubt a "New World" style wine even though the grapes that make up the blend are all native to either France, Italy, or Spain. On the nose I get lovely aromas of black raspberry, tart cherry, vanilla, oak, dark chocolate, and hints of cedar box. I love the bright cherry aromas as this wine opens up and the impression that this wine is something more than just a regular "Cabernet" type blend. On the palate those sour cherry notes burst onto the palate and combine with red apple skin, vanilla, toasted oak, black licorice, cassis, cedar, and a touch of cinnamon flavor. The texture is soft and the tannins are well integrated. The finish has a very nice plum and tobacco note that accompanies the red cherry flavors.